RUE MORGUE, 1984 Publishing and Michael Gingold celebrate ’80s horror in “AD NAUSEAM”! The only things more shocking and outrageous than the horror films of the 1980s were the ads promoting them in the newspapers of the time. Now, a book compiling over 450 of those rare, eye-teasing images is coming under the RUE MORGUE banner! 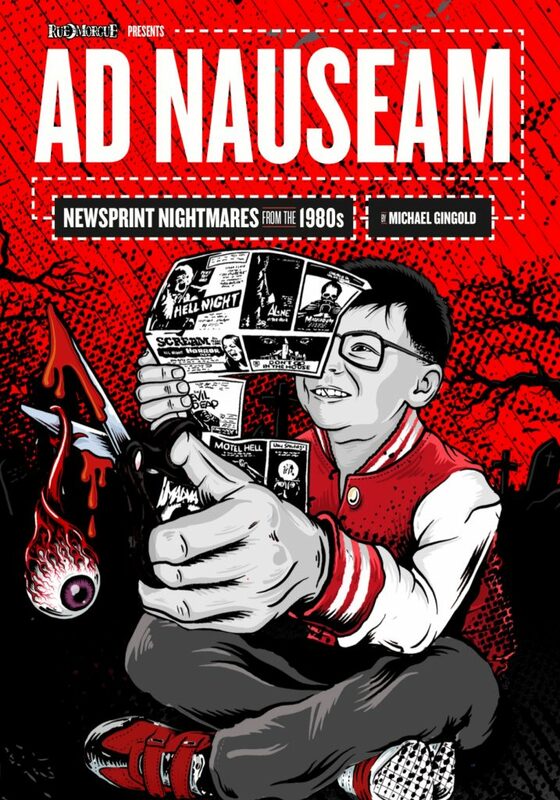 1984 Publishing, which previously put out GHOULISH: THE ART OF GARY PULLIN, will unleash AD NAUSEAM: NEWSPRINT NIGHTMARES FROM THE 1980s on October 9. Within its pages, our own Michael Gingold, who collected these ads all through his youth in the 1980s, presents over 450 of them, for fright films of every kind—from major-studio releases to the tiniest independents, from art-house fare to 42nd Street sleaze, and everything in between. Gingold annotates them with reminiscences and commentary on the ads and the movies they were hawking, and includes excerpts of reviews from the time of over 60 films, revealing what critics back then actually thought of them. He also provides an interview with the people behind legendary exploitation distributor Aquarius Releasing, who came up with some of the decade’s most outrageous campaigns. The striking cover is an original illustration by RM art director Andrew Wright. AD NAUSEAM is now available for pre-order at Amazon.com. Gingold will preview AD NAUSEAM with a presentation and book-launch event at Montreal’s Fantasia International Film Festival on Sunday, July 22. Visit 1984 Publishing’s official website, Facebook page, Twitter and Instagram. EW.com posted some exclusive first-look pages from the book, and you can see those here.